People desire felt on wood projects for a variety of reasons. Adding felt to your project can increase the aesthetic qualities, protect from scratches, and eliminate friction. However, the task of adhering felt to any surface can be taxing, especially when sticking to a hard surface, such as wood. 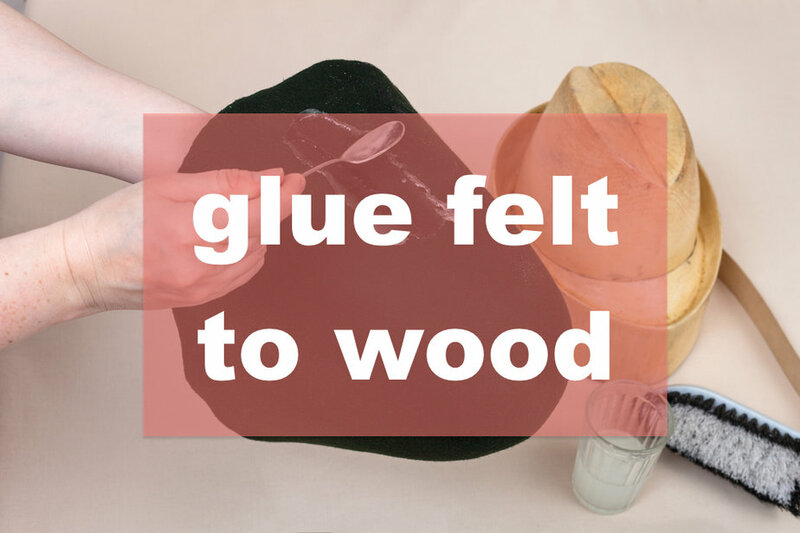 The felt tends to soak up the glue making it ineffective and messy. Also, many times you need to add the felt to small, tight spaces with little to no room to work. Don’t be discouraged though! Overcoming these obstacles ensures your project will function properly and be treasured for years to come. By following these five simple steps, you are on your way to having a beautiful piece to display in your home, sale, or give to someone about whom you care. Like all textiles, felt tends to stretch as you work with it. Higher quality felt will stretch less than a lower quality. Also, if your felt will be exposed to light, fading could be an issue with some brands, especially those that are not as well known. Be sure to purchase felt manufactured from a reputable brand with good reviews. Pay attention to the thickness of the felt your purchase. The thickness needed will vary by project and the felt’s purpose. The type of glue you need to purchase depends on the size and accessibility of the space to which you are applying felt. When learning how to glue felt to wood inside small spaces surrounded both other areas, wet cement is the best solution. Spray adhesive works best for large areas or areas where overspray is not an issue. For small projects that will not incur a large amount of strain, white Elmer’s glue may be suitable. If you are using wet cement or Elmer’s glue, you will need foam brushes to apply the glue. Most hardware stores sell cheap, black brushes in a variety of sizes that can be thrown away after application. If you choose to purchase or use a brush that will be reused, invest in some paint thinner or remover to clean the brush with after application. If you are using spray adhesive, you will need removable tape, such as painters tape, and newspaper or other similar materials to block off the areas adjacent to your felt space. You will also need one or more tools to smooth wrinkles out of the felt. Rollers work well for large areas, while an old credit card or scraper will do for small spaces. Start by measuring the length and width of the area to be covered. Remember to account for any cut outs, or extra pieces. Once you’ve measured the area, trace it on the felt and cut it with scissors or a utility knife. Before applying glue, test the felt in its new location. Stretch it a little as you go to ensure little to no excess. If it is a particularly complex piece, with several measurements, consider making a template with cardboard or paper prior to cutting your felt. Measure each section and draw it on the template. Cut out the template, and fit it onto the wood to ensure a proper fit. Then use the template to cut out your felt. Templates greatly assist in figuring out how to glue felt to wood inside a box or other object. This option works best for areas that will be accessible after gluing the felt down. Lay your felt on the area it will be placed and roughly trim. Leave excess felt all the way around the project and do a final trim in Step 5. If using spray glue, first tape off areas in danger of being hit by overspray. Apply the glue you chose to one side of the felt and one side of the wood. Pay careful attention when choosing the appropriate side if you are using patterned felt or have cutout areas. Cautiously place the wet sides together starting in one corner. Apply pressure as you move to the opposite edge, paying special attention to all corners and edges. Be careful that you do not stretch the felt as you go, or your piece may not fit once you get to the end! Once the felt is in place, use a roller or other tool to eliminate any bumps in the felt. Starting in the center, move out in every direction. As extra insurance against glue bleeding through and adhering to an object, place wax paper over the felt. Then, if possible, weigh the felt down with a heavy object to ensure it does not lift while it dries. Let the glue dry for a minimum of ten minutes or as indicated by the glue manufacturer. Your glue bottle should specify drying times for a variety of materials. Once the glue dries, remove the objects and wax paper. Your felt is now attached! Inspect your project thoroughly for edges that are uneven, or overhang. Using a utility knife remove any imperfections. If you are working on a larger piece, a straight edge can be incredibly useful in this step! Taking a few moments to perform this extra step greatly improves the appearance of your project making it look more professional. Also, removing any overhang keeps the felt from snagging and tearing off.